1. After getting a ridiculously high bid for some minor bathroom leaks from another plumber, I called your company. There were very helpful and courteous, and let me know upfront what the cost would be. There quote was almost TWO-THIRDS LESS than the other quote. The plumber arrived exactly on time, and took the time to explain what he was doing to make the repair. Not only would I use you again, but I will also recommend his services to all of my friends and neighbors. Superb service at a reasonable price! 2. I needed the water hoses on my washer changed and was unable to do it myself as the fastenings were ‘frozen.’ I also had questions about various plumbing fixtures in the house–how long my hot water tank should last, e.g. My plumber arrived promptly, changed the hoses, and courteously answered all my questions. 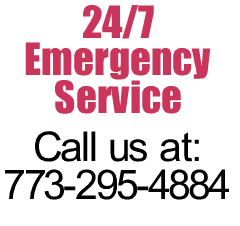 His prices are reasonable.If you need a plumber, call 773-295-4884 and get the best in Chicago. You won’t be sorry. 3. This morning while I was in the shower, I noticed that the toilet was gurgling loudly. When I got out of the shower the toilet was full almost to the brim with water. I turned the water supply off to the toilet and bailed out the clean water. I left it alone for the rest of the day. When I returned home I called your phone number. I told you that I thought I had a clog in the main line and asked him to come over and take a look at it. He told me that it might have been a back up from the storm drain, due to all of the rain we had last night. He told me to try something before he came over, so I could avoid a service call fee. He told me to turn the water supply back on to the toilet and see if it would flush normally now. Also he said to run the water in the shower to see if it still gurgled. It flushed normally and did not gurgle when the shower was on! I was relieved. He didn’t charge anything for the phone call and I really appreciated his knowledge and advice. I really appreciate that he didn’t come over just to collect a service call fee. He is honest and that is so rare in today’s society. I am grateful. He is wonderful! I would recommend him to everyone. 4. My kitchen sink a year ago became clogged because the former owners would pour grease and such down the garbage disposal. Needless to say we called the BIG NAME in Chicago, but they ended up staying for two & a half hours & charging us an arm & a leg. The day after this past Christmas, it had become clogged again (because my visiting mother -in-law had poured who knows what down the disposal) and I typed in plumber under Google search. Pete the Plumber are the only ones that had all 5 stars & rave reviews. Not to mention, the people that reviewed them said their prices were well below average & they stuck to their estimates. Not only were all the reviews correct, but they customer service was astounding! I had called and within the hour your plumber was there & shortly after he was done….no dilly dallying just so he could charge more per hour! He was friendly & explained everything thoroughly, along with cleaning up after himself & being as quiet as possible during the process since he knew I had a newborn in the house! After using them, I had spoken to a bunch of my friends & a number of them had used and highly recommended them! 5. Your Plumber is the best!! He squeezed me in the day after I called him because my pipe was leaking badly. When I talked on the phone to set up the appointment, he made sure I knew how to turn the water off and on (when needed) to keep from wasting water and flooding my crawl space until it could be repaired. When they arrived, they analyzed the problem and repaired it in record time and even found time to replace my kitchen sink hose. I think the price was very reasonable, based on my last two plumbing experiences (one of which was a nightmare!!). I am so glad I FINALLY found a plumbing company I can trust (after 22 years of living in this house!). Very professional and friendly service. Thanks and kudos to Pete the Plumber. 6. Ray your plumber came over within two hours of my phone call this morning. He told me what my options were and we went from there. Even though he had to cut a hole into the wall, his work was very neat and professional. I would definitely call him if I ever had another problem. 7. Professionalism, punctuality, integrity, fairly-priced…..those and many more positive traits describe your plumbing company. The plumber, Ray replaced a water heater at my house. Impressed with his super work, I also had him repair items in three bathrooms of a professional building I use. Equally outstanding. You can’t do better than your plumbing company!